The True Story of Critter Angels is a truly delightful book for 'children' of all ages. 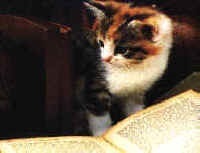 The story was written by Yani, a rescued kitty angel and her human companion Shendl Diamond. Shendl wrote the story over her beautiful full page illustrations of Yani and her angel friends. We agree with Yani and Shendl that "anyone who has opened his or her heart to an animal knows a critter's capacity for love, connection, and devotion." This is the perfect love that the Bible speaks about, but that most humans have lost, or not learned to fully accept and share with all other living beings. 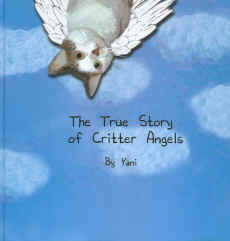 The True Story of Critter Angels helps to teach us how to expand our sphere of love and compassion. The True Story of Critter Angels is a book that all parents and grandparents should read to their children and grandchildren before the young ones lose their God-given empathy for all other living beings. And hopefully, in the process, it will renew the unconditional love and compassion in the older folks, too, until we truly have peace on earth as it is in heaven. Shendl Diamond enjoys the balance of her dual professions as artist and life coach. She has a master's in counseling psychology and has been involved in rescuing and caring for animals for as long as she can remember. She is honored that Yani invited her to help write this book.